A sign for Red Tails, Silver Wings, a visiting display of Tuskegee Airmen-inspired paintings by artist Chris Hopkins, sits outside the Hall of Honor at the National Museum of the United States Air Force near Dayton, Ohio. February marks our nation's observance of Black History Month, a period set aside annually to reflect upon the contributions made by African-Americans to the country's endeavors during its 237-year existence. 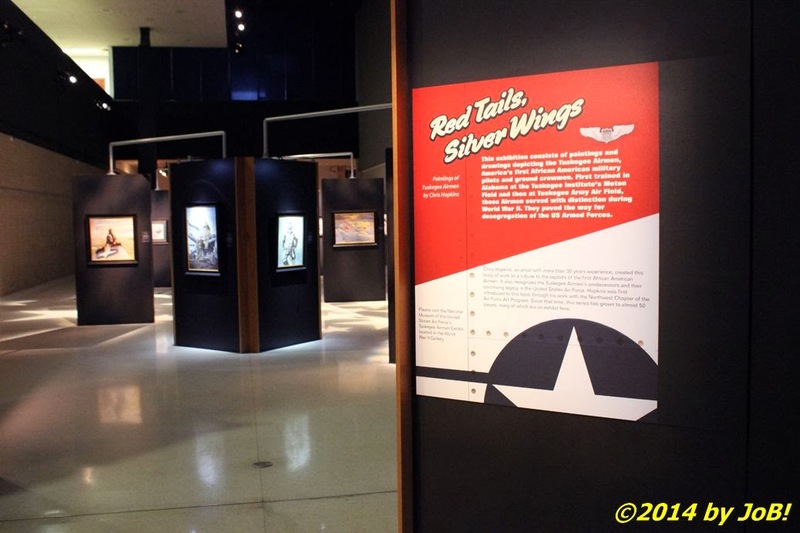 Many communities across the nation hold celebrations to highlight the exploits of local individuals or organizations and Dayton's own National Museum of the United States Air Force is currently hosting an art display honoring that group's role in US aviation history through the end of the month. 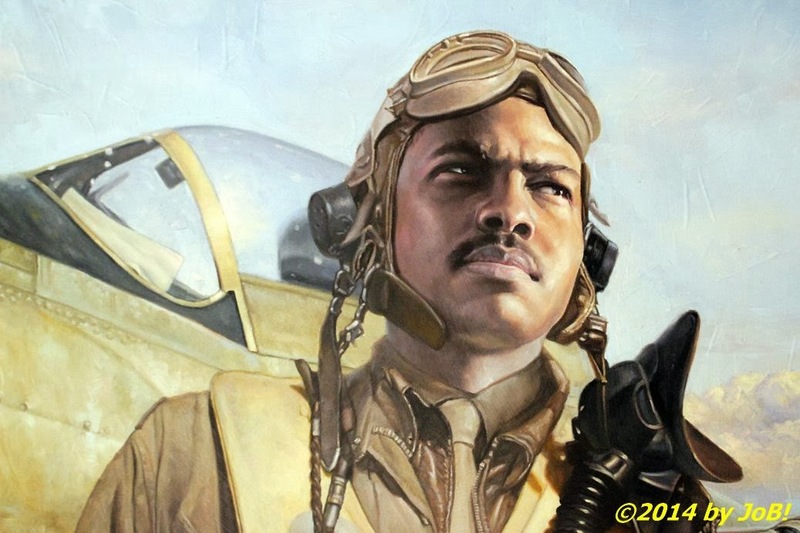 On loan since May 2013, this exhibit, titled Red Tails, Silver Wings, features the oil paintings and charcoal drawings of artist Chris Hopkins that were inspired by the socially groundbreaking activities of the Tuskegee Airmen, our nation's first African-American military aviators. With his roots in the movie and music industry (to include the cover and sleeve art for Styx's Paradise Theater album in 1981 and the posters for Indiana Jones and the Temple of Doom and three Super Bowls), he moved into portraits, landscapes and works of current and historical art and was invited to join the United States Air Force Art Program in 2004. These loaned works focus on the activities of the US Army Air Corps' 332nd Fighter Group, the military designation for the primary grouping of these segregated flyers and support personnel. Trained at Morton and Tuskegee Army Air Fields in southern Alabama, this recruiting experiment helped to end a 20-year boycott of African-Americans from the cockpits of US military aircraft (Eugene Bullard, credited as the first African-American military pilot, flew with the French instead of the United States during World War I because of racial policies within the US military). A display honoring the accomplishments of Eugene Bullard in the National Museum of the United States Air Force's Early Years Gallery hangar near Dayton, Ohio. From 1941 to 1946, almost one thousand pilots served in that fighter unit and a sister bomber squadron in the Allied efforts in the European theater against Germany and Italy. 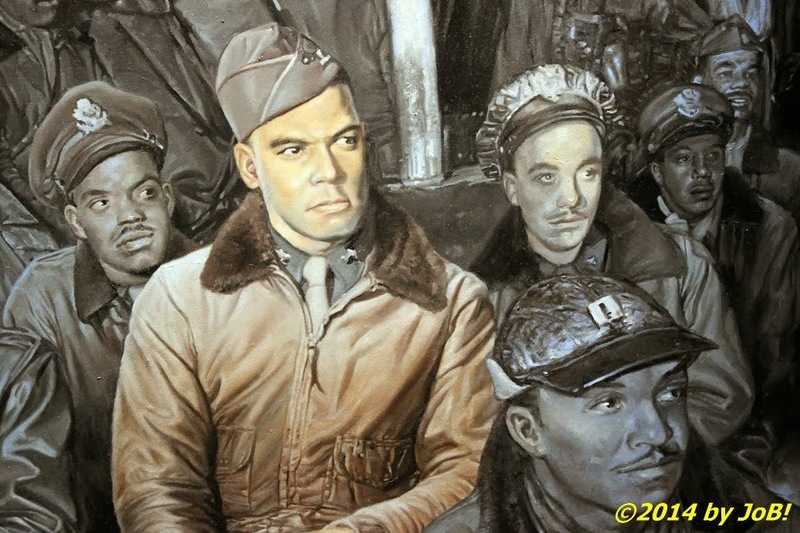 Hopkin's paintings are a mix of inspired scenes of generic military figures and specific individuals, to include their commanding officer Benjamin O. Davis and future Air Force four-star general Daniel "Chappie" James. Prior to arriving in Dayton, this exhibit was displayed at Seattle's The Museum of Flight, a short distance from Hopkins' home in western Washington. From Dayton, the art will move on to Temecula, California, the Rosa Parks Museum in Montgomery, Alabama and, beginning in February 2014, the San Diego African-American Museum of Fine Arts. 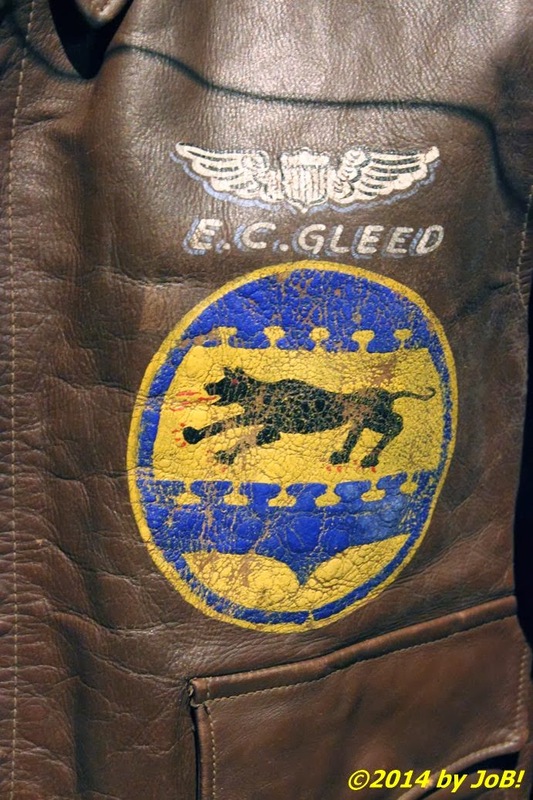 A flying jacket worn by retired Colonel Edward C. Gleed, showing his pilot wings as well as the emblem of the 332nd Fighter Group, on display in the World War II Gallery hangar of the National Museum of the United States Air Force near Dayton, Ohio. One of the advantages for viewers at the Dayton display is that they can venture into several other portions of the museum to see historical artifacts of the actual Tuskegee Airman and other African-American aviation pioneers. 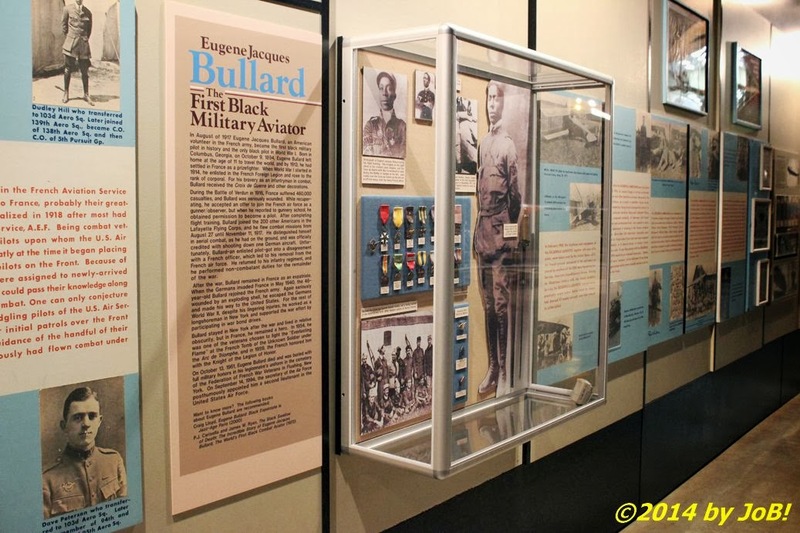 As mentioned earlier, Eugene Bullard is universally recognized as our nation's first black aviator and there is a display honoring his achievement in the Early Years Gallery. There are three separate areas in the World War II Gallery hangar that depict the activities and accomplishments of those segregated units during that conflict as well as the eventual racial integration of the US Air Force in 1949, just one year after President Truman's desegregation executive order. 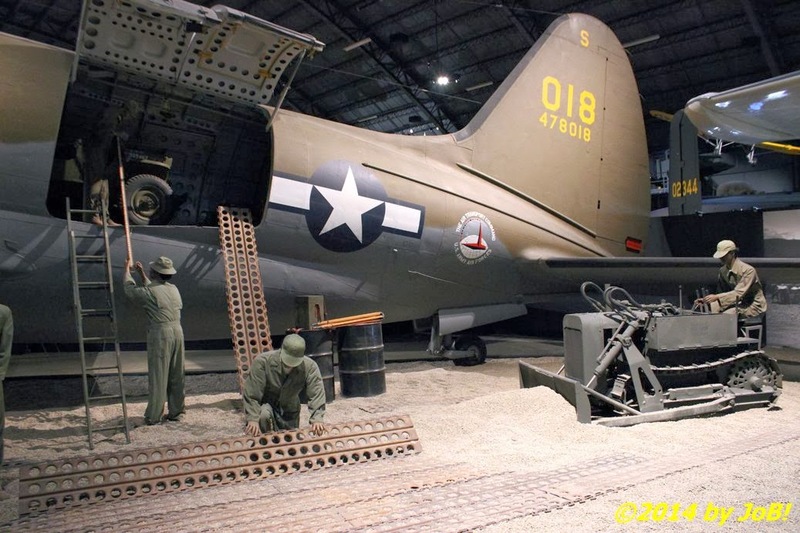 Members of a segregated Engineering Aviation Battalion constructing an improvised runway in the World War II Gallery hangar at the National Museum of the United States Air Force near Dayton, Ohio. Situated just outside Area B of Wright-Patterson Air Force Base, the National Museum of the United States Air Force is the world's largest and oldest aviation repository with over 360 aircraft and missiles on display. 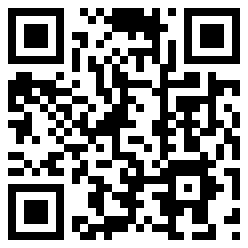 Admission is free and the museum is open every day except New Year's Day, Thanksgiving and Christmas from 9AM to 5PM. Future plans include the opening of a space shuttle-related exhibit in late March and the dedication of a new hangar that will house displays currently residing in a physically separate presidential and experimental aircraft facility on the military installation. 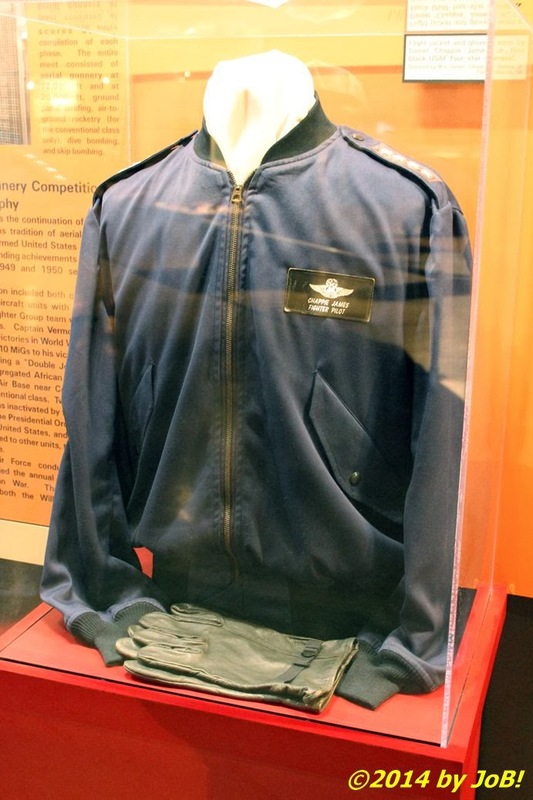 The flight jacket and gloves of Daniel "Chappie" James, the Air Force's first African-American four-star general, is on display in the World War II Gallery hangar at the National Museum of the United States Air Force near Dayton, Ohio.